When you live in Phoenix, you’re living in scorpion territory. That’s simply a fact that comes with living in the Arizona desert. During the winter, scorpions are less active and can be found indoors. In the summer, scorpions are actively hunting for food or a mate and can be found inside and outside. Scorpions like to shelter in dark cool places with an air flow, like cracks and crevices inside block fence walls or under palms tree bark. Living in scorpion territory doesn’t mean you have to live WITH scorpions in your home. If you have scorpions inside your home, contact an experienced scorpion control professional to evaluate the situation and recommend an effective treatment for you. The Phoenix, Arizona area is in the Sonoran Desert, and scorpions are native to desert environments. 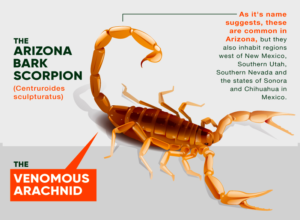 If you live in or near Phoenix, chances are you’ll run into scorpions on your property or in your neighborhood sometime. You can refer to recent maps to see where scorpions have been reported in the Phoenix area. Arizona is home to the Arizona Bark Scorpion, which the most lethal venomous scorpion in the United States. It can also be found in parts of Nevada, Utah, New Mexico, and Mexico. You can find other scorpion species in Arizona as well, like the desert hairy scorpion. However, other scorpion species in the USA do not pose a medical threat like the Arizona Bark Scorpion. 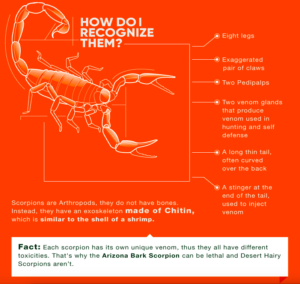 The Arizona Bark Scorpions has a “subaculear tooth”, or a small bump on the tail that juts out beneath its stinger. The easiest way to identify an Arizona Bark Scorpions is by watching it! These scorpions lay their tails down parallel with the surface they are on when they’re at rest. Other scorpions keep tails up over their bodies. When you come into contact with a scorpion, and you’re not sure which species you’re facing, exercise caution and treat it like it is venomous. Arizona bark scorpions are nocturnal and capable of climbing textured surfaces, so be aware that you can find them on walls, ceilings, in trees and high on shelves and furniture. This includes brick walls, stucco walls, wood paneling, and drywall. Scorpions can also survive underwater for hours, so it is possible to find one alive in your swimming pool, sink, bathtub, or toilet. Arizona bark scorpions tend to gather in groups (especially during cooler months) so when you see one, others may not be too far away. Arizona Bark Scorpions are attracted to cooler, moist areas that have sufficient airflow. Specialized scorpion control treatments treat all cracks and crevices around your home and yard to eliminate scorpions inside and prevent further infestations. Another way you can reduce your chance of scorpion infestations around your home is to seal up any holes or cracks in your foundation, sidewalks, block wall fences, and exterior walls. You should also repair and replace old door sweeps and weather stripping around windows and doors. Arizona Bark Scorpions eat crickets, cockroaches and other insects. You can help prevent infestations of pests to help discourage a scorpion infestation. After all, scorpions are predators that follow food sources. Inside any cracks and crevices especially concrete cracks and crevices! The Arizona bark scorpion survives 12 months out of the year. Usually, scorpion season begins when the temperature hits about 70 degrees Fahrenheit, which is usually in the early spring. This is when scorpions become most active. You can hunt scorpions around your home. Generally, you’ll find them in the dark and just before sunrise with a black light – flashlight. New moon and cloudy nights tend to be the best for hunting scorpions because they’re the darkest. When you’re searching for scorpions in your home, don’t forget to look up high. As we mentioned, Arizona bark scorpions climb. Shine your flashlight high on walls and ceilings, down by the concrete foundations, and on block wall fences. Instead of using a regular flashlight, use a black light. Arizona Bark Scorpions glow under black light and look almost fluorescent. Pick scorpions off walls, ceilings, block wall fences, branches, and out of debris piles with needle nose pliers. Place them carefully in jars and screw the lids shut. Using a glass jar to collect scorpions prevent scorpions from climbing out because they can’t climb the smooth glass surface. When you are hunting scorpions, wear thick gloves to prevent stings. If you do not feel comfortable killing the scorpions yourself or your infestation is too large for you to handle on your own, call a professional pest control company to handle the job. An experienced scorpion control professional will not just kill scorpions on contact, but they prevent scorpion infestations in the future. Scorpions aren’t like other kinds of pests. They can’t be controlled with general pest control like other types of bugs. Scorpions need to be treated with specialized products formulated to be effective specifically on scorpions. There are several over the counter “scorpion killer” products at home improvement stores but don’t be fooled, this may be best left to the professionals. Over the counter products only kill scorpions when they are sprayed directly. They DO NOT keep killing or repelling scorpions after they dry. Scorpion populations need to be managed with compounds specifically formulated for scorpions. Unlike other pests, which can be managed with less potent compounds, scorpion control involves potent compounds mixed with extended exposure agents. This is because scorpions tend to hide out in nooks and crannies throughout homes and yards. Effective scorpion control keeps killing scorpions even after treatments have dried and keeps working for about a month. When you have scorpions in your home and property, work with a scorpion pest control professional who can eliminate the problem and prevent future infestations. Contact Responsible Pest Control today to set up your initial consultation, and start effective scorpion pest control for your home. Sinatra is a tuxedo cat and he is handsome, fluffy, snuggly and very social. He is a mature gentleman with a birthdate of 12/23/2012. Sinatra prefers wet food over dry and he will come running when a treat bag rattles. His treat of choice is Temptations, and he has been known to send volunteers out to the store when the shelter runs low. Sinatra also has a way with the feline ladies. 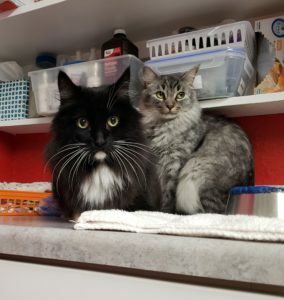 Thelma is his tabby, long-haired girlfriend. If you are looking for two cats, Thelma is also available and her birthday is 5/26/16. Sinatra loves to be up high, so if you have cat trees or shelves, Sinatra will make himself right at home! Home Fur Good open Thursday, Friday and Saturday from 11am – 4pm and is located at 10220 N. 32nd Street in Phoenix. Home Fur Good can also be reached by phone at 602-971-1134 or by emailing Info@homefurgood.org. You can also check out the website at HomeFurGood.org. Is the Housing Market Losing its Steam? Recently national housing statistics have made headlines regarding the diminishing demand of homebuyers. This is understandably unsettling to homeowners in the valley who recall all too well the housing crises where supply and demand went topsy turvey. As interesting as it may be to listen to national housing statistics, they are generally antidotal. Even in the midst of the housing crisis of the “Great Recession” there were markets that saw little downturn – proving that real estate markets are local. Is the valley in the midst of dwindling demand? The short answer – a slight abating of demand is possibly underway. Is it so great to affect pricing or cause any significant impact to our market? No. This is due to the largely chronic lack of supply. Perhaps some numbers can better put this in perspective. 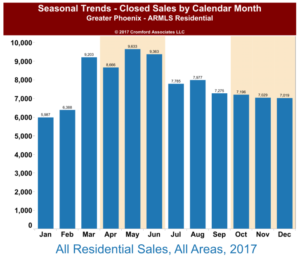 Demand The first thing to understand is the seasonality component of real estate – i.e. different times of the year perform differently. Headlines can rather easily claim “buyer demand is down” simply by comparing April’s numbers to September’s numbers. Buyer activity reaches its peak in April and then increasingly slows through the rest of the year. To have meaningful comparisons year over year numbers should be examined. One key measurement of buyer demand is contracts. We can then see for instance, that contracts have dropped 26% from the April peak this year, compared to a 20% drop in 2017 over the same time period. That can lead us to the conclusion that a slight weakening in demand may be underway. Slight being the keynote concept. The total number of active listings … is 19,736 today for all areas & types across the ARMLS database. This is just slightly above June 15, 2011 when we saw 19,696. We have to go all the way back to October 2005 to find another 15th date (19,715) with lower active listings. Active listing counts have been on a declining trend since April 2014 when we hit a short term peak of 30, 506. We would consider somewhere between 30,000 and 35,000 to be sufficient for a balanced market. The all-time record high for a 15th date is 58,195 in November 2007. Between 30,000-35,000 active listings would be considered a balanced market. As of this writing the active listing count is at 19,860 – not even close to a balanced market (and remember, that even balanced markets do not cause price drops – they just stop or slow appreciation). There are some areas that have seen a dramatic rise, often from abnormally low levels. Florence is probably the best example. At the end of June we had just 100 active listings without a contract, but since then the count has shot up 38%. The trend does not affect mobile homes, but single-family listings have jumped from 71 to 111, an increase of 56% in just 8 weeks. A similar but smaller event has occurred in Casa Grande and Coolidge. The only areas outside of Pinal County with a jump like this (albeit more moderate) are Litchfield Park and Surprise. Fluctuations in demand are unlikely to have much impact on the market until we see an increasing trend in listing counts. This was the first sign of a slowdown in April 2005 and will be the first sign of a slowdown if and when we get one in the future. It came suddenly and unexpectedly in April 2005 and it may do the same at any time. However, nobody paid any attention in 2005 and I am assuming we are all older and wiser now. Any unusual activity in the listing counts will show up in the daily Tableau charts which we create and study each and every day. We too watch the listing counts. When we see shifts, you will hear it from us. Until then, do not believe the headlines. As always, we are here to help you with any questions or concerns specific to your home or neighborhood.